When news first emerged that DC Comics were going to re-interpret a sizable array of Hanna-Barbera’s most iconic stars such as The Flintstones and Scooby Doo and give them a modern makeover, there some doubt expressed that this could be achieved with any sort of creative substance. After all, delightful though they were to watch in cartoon series of old, and though they had many an entertaining quality, pretty much every single character was reasonably cardboard cutout-ish, possessed of a few key attributes but not much in the way of backstory or meaningful insight. In this brave new Snagglepuss world, there is far less camp tomfoolery and no “Exit Stage Left!” to speak of, and a whole lot of serious introspection about the way society demands everyone fit into the same narrow mold, and how if they fail to do so, all hell can break loose upon their heads. 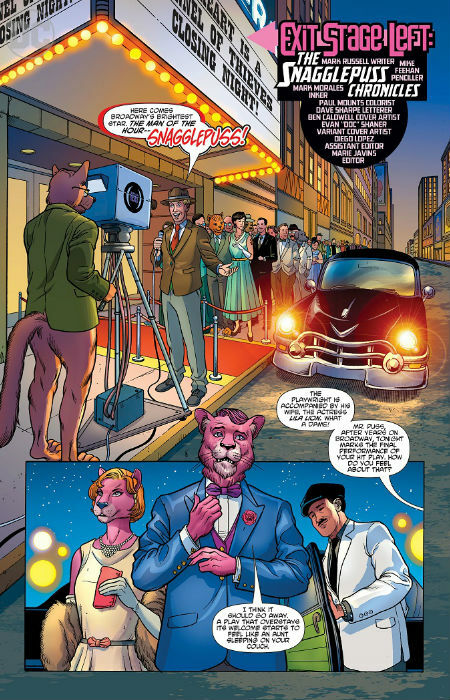 In The Snagglepuss Chronicles, the character once voiced by the great Daws Butler to deliciously flamboyantly rambunctious effect, is a much-vaunted 1950s playwright, a southern Gothic doyen of the creative arts who dresses like a dapper Southern gentleman (he hails from rural Mississippi) whose play “My Heart Is a Kennel of Thieves” is wrapping up a famously long-run on Broadway, is friends with Dorothy Parker, she of the Alonquin Table and who is, marriage to Lila Lion to the contrary, secretly gay and in love with the Cuban exile Pablo. His is a life simultaneously lived in the glare of public adoration and in the shadows, a doting husband to stage actress Lila to keep the social gatekeepers happy and morally assuaged, and a caring boyfriend who meets his true partner at Stonewall in The Village in New York and wherever prying eyes aren’t lurking. It’s a fraught existence in some respects but Snagglepuss has long ago made his peace with it; well as much peace as you can make with a dual existence that never allows you to lay down your guard. How much of a balancing act this double-life is is brought home to Snagglepuss when his Southern novelist friend Huckleberry Hound arrives in town – against all expectations writer Mark Russell weaves in Huckleberry, Squiddly Diddly and Augie Doggie to impressive effect – recounting how he has been found to leave his marriage, child and entire life behind when his wife discovered his relationship with another man. This revelation, which seems to do little to unsettle Snagglepuss’s cheeky, highly-literate bravado, throws the dilemma many men in 1950s America faced – be true to themselves and be ruined or flit between the light and shadows and hope notices you moving between the two. The consequences as Huckleberry Hound demonstrates, and which Russell depicts with great sensitivity and insight, can be near cataclysmic, the end of all things as society, or that section of it that polices morality for dubious reasons, exacts its price for unacceptable transgressions. The greater threat, and yes hard as it is to believe, there is a deadlier force at work, comes from the House Committee on Un-American Activities, Senator Joe McCarthy’s oppressively virulent crusade to keep America safe from the undemocratic tyranny of the much-ballyhooed communist hordes. Of course, the supreme irony is that a crusade designed to supposedly protect democracy actually ended up running cruel and merciless roughshod over it, with many innocent people dragged through the personal and professional mud on some sort of demented crusade. That conversation out on the terrace, cigarettes in hand, beautifully typifies Russell’s elegant style, which never comes close to being manipulatively polemic or rantingly clumsy. Rather he allows his characters to simply live their lives, with their opponents and oppressors effectively hanging themselves on their own petards with their own actions and words. It’s a masterful piece of storytelling that, coupled with exquisitely rich, colourful and evocative art by Mike Feehan, delivers up a stinging rebuke to the small minds and cold, judgmental hearts who position themselves as the arbiters of morality, ethics and human decency. 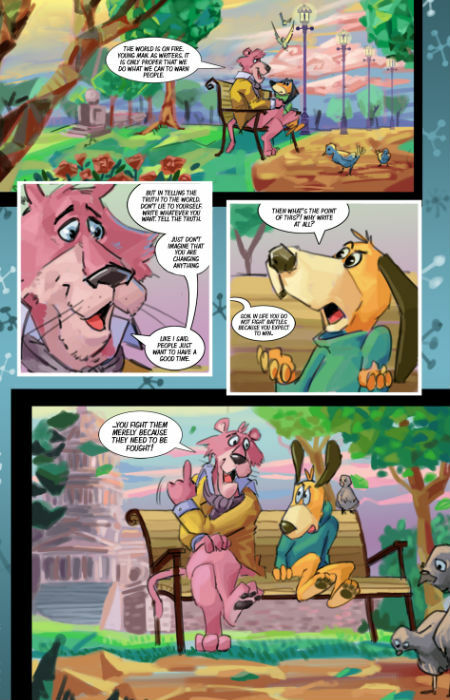 That they are obviously nothing of the sort becomes graphically clear in the first two sublime-good and confrontingly-nuanced issues of The Snagglepuss Chronicles with the decency and authenticity of the likes of the titular protagonist and a wide array of friends such as Huckleberry Hound, standing in stark contrast to the base shabbiness of McCarthy and his tawdry ilk. Snaggelpuss, of course, wants nothing to do with Gigi Allen, Special Counsel to the House Committee on Un-American Activities when she calls him, at the Alonquin Table no less, to act as a propaganda mouthpiece for McCarthy’s attempts to remake America in his blighted, small “s” style. “I think what you want is not my help but my capitulation. “I think you don’t give two feathers about how some playwright from Mississippi might affect the outcome of World War Three. You’re not enlisting my help against the Soviets. You’re enlisting the Soviets to help you control what we say and do. 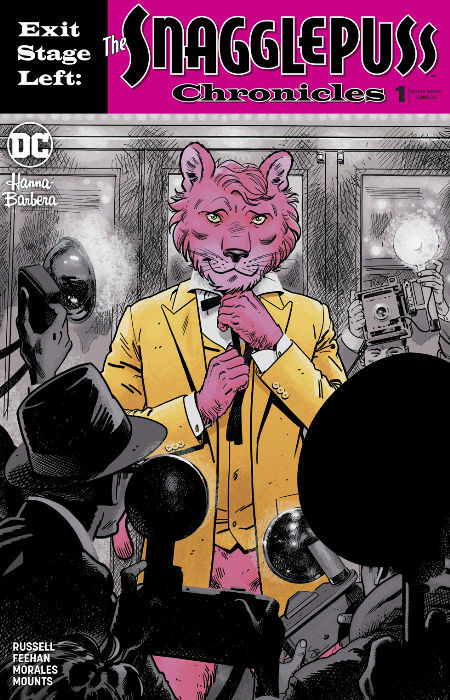 With that one speech, which occurs close the end of issue #2 and as you might expects ends nothing, Russell nails his and Snagglepuss’s colours firmly to the mast, setting up some thrilling and no doubt potently incisive issues ahead.